Using brushos for the panels. The stitched dies are from STAMPlorations, the sentiment form Verve and the die from PTI. I do love how this card looks, makes me want to smile! 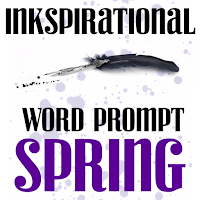 Our Guest Designer for this challenge is Trinia. She makes amazing cards.I follow her on Instagram and her blog and every card she makes is a delight. Take a look at her blog here and you will see what I mean! Trinia and all the DT have Spring in the air and have made cards to reflect this-take a look here. 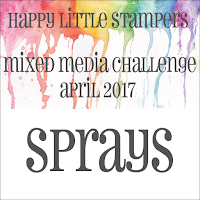 Happy Little Stamper Mixed Media-Sprays-I have used brushos and water. Beautiful card and Brusho background, Sandie! Love the bright spring colours. And thanks for your sweet write-up about me. I really appreciate your support. What a fresh card! Love the cours and the beautiful background! Hope you have a sunny day too! Gorgeous card, very much spring!! So beautiful Sandie. Love that you kept the leaves white. Soft and soothing. Love the spring colours and lovely Brushos. Your cheerful card has me smiling brightly, Sandie! How fabulous your Brushos panel! 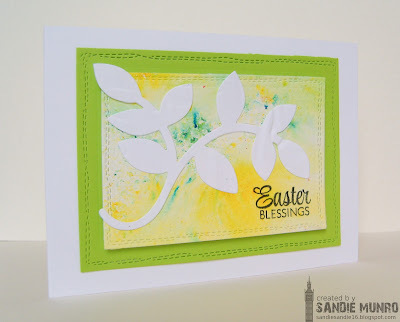 Gorgeous Easter card in every way! Using Brusho's?? My oh my your getting adventurous with your cards...I love it!! Such a fantastic effect for the background and love the fresh colours against all that white. 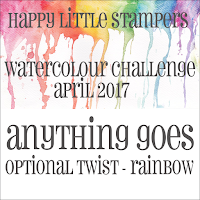 So excited to see you at Happy Little Stampers!! Just beautiful Sandie! Love the brushos background! I'll miss being on team Ink with you but will be by for visits for sure!